Lots of people talk about product-market fit in mythical, binary terms—it’s something that you have or you don’t. But how do you go about getting product-market fit? We hosted a DesignTalk with Dan Olsen, Product Consultant and author of The Lean Product Playbook, on his 6-step process for iterating your way to just that. Dan covered how to understand customer needs and use them to formulate your product’s value proposition , and also how to create MVP prototypes and test them with customers so you can improve your product through rapid iteration. 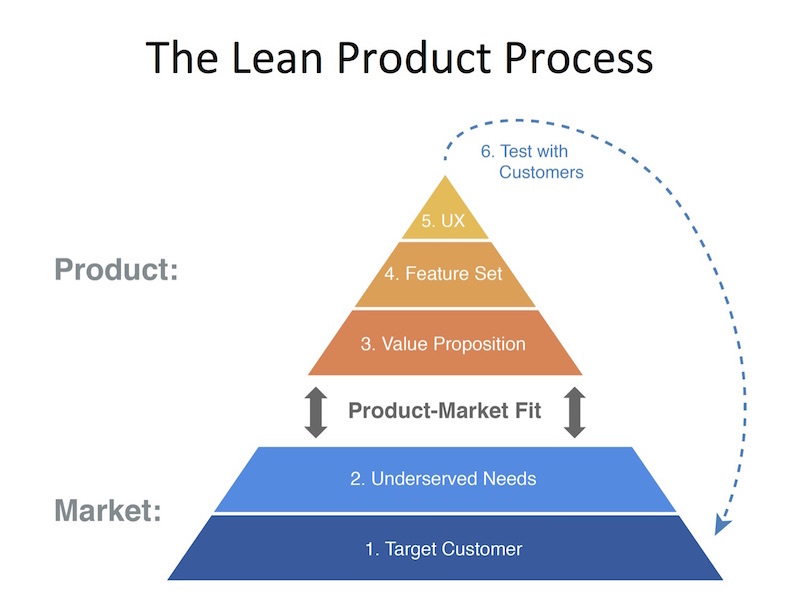 Dan shared with us a great visualization on the product-market fit pyramid. Everything starts with the customer—the bottom layer, and each layer depends on the one below. Within the market’s needs, the second layer, it’s important to focus on the underserved needs. Those 2 layers make up the market. The top of the pyramid is your product. Starting from the value proposition—the benefits you provide to your customer, moving to the feature set or the functionality of your product, and then finally moving to the UX—or bringing the features to life in a way that your users find them easy to use. How these 2 pieces fit together is—you guessed it—product-market fit. This pyramid is a way to categorize all of the assumptions you make as you design your product. Dan built a process around each step of the pyramid, tests those assumptions with customers, and then runs through the process again. To learn more about the Dan’s process, and to see more amazing slides like the one below, I encourage you to watch the recording at the top of this article!